I could talk about the atmosphere at games, view from seats, smell of burgers but that has all been written about before. This is more an account from my years as a GOONER. If I am being honest I can’t remember my first Arsenal game. I was that young (5years old) when my dad took me to my first game. The reason I support “The Arsenal” is because of my dad, I mean you always follow your dad’s lead. Right? Unless your @petemartin who was far too clever at a young age to become a spurs fan like his dad. I remember sitting in the East stand, we were playing Wimbledon & my brother was the mascot, shooting balls at John Lukic & of course netting one, which brought a cheer from the clock end. 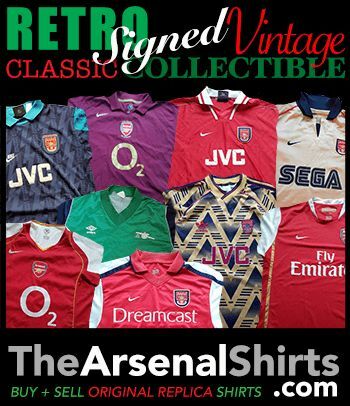 This annoyed me as I was the bigger “gooner”, I lived, breathed arsenal, bought the shirts (kind of), cried when we lost & would not eat my dinner (mum hated it when we lost). Dad used to say if we lose make yourself scarce…go out as we won’t be happy. The worst line a Lady can ever say is “it is only a game”….sh*t would hit the fan then. There was a benefit of my brother being mascot. I got to go to the marble halls & into the payers lounge after the match. I will never forget this, we met Rocky, Paul Davis, Michael Thomas, Richardson & more. We were waiting for “Captain Marvel” Tony Adams of course (he was mums favourite). Then he appeared in the marble halls, as we were about to leave, he stayed talked for 15 minutes, pictures, signed programmes etc. Me being a cocky little Sh*t said “ where you been Tony?”, he responded “getting your ball signed son” & then handed over the ball and patted me on the head. TA never was the gentlest, that pat hurt, though I did not mind! Like all good dads ours signed us up to the junior gunners & we then sat in the lower west stand in the Junior Gunners section. I used to love choosing the photo’s that came out in the Junior Gunner pack. I always chose Rocky, as he was my hero. I was a bit like Carl Jenkinson, in that I had arsenal pictures, posters on every wall in my bedroom, though never had the bed spread. My prized picture now is of the last day at Highbury & the great Henry Cooper is in it (have a look if you have the same one). My first experience of silverware was the 1987 cup final, I was 6 yrs old. I remember watching on the T.V & hearing the crowd singing “Charlie, Charlie, Charlie, Charlie of course for Champagne Charlie Nicholas. My first away day was in 1988 away to Wimbledon at Plough Lane, the only other time I had been to Wimbledon was to the dog track! I was 7 yrs old, I had my Arsenal top on, a scarf (was a hot day), Arsenal badges & of course wimbledon had won the FA cup the season before. We smashed them 5-1, with a hat trick from smudger. Coming away from the ground we knew we had a good side that year & so it turned out. I was not allowed to Anfield but of course was able to watch on TV & having read others blogs on here it sounds like it was probably the best night in our history – it was against the odds, against a great l’pool side but we did it & will never, ever be forgotten. The coming years after that saw us win another league title, Double cup year, CWC winners, really great times as a gooner. That Era then came to a halt, george took bungs or did he? I don’t know and don’t really care, anyway he was gone. We then had an “interim” manager for a year that bought us probably the best player I have ever seen so we must be thankful for that. Then it was a certain Mr Wenger that turned up at the marble halls & the trophies then continued and these memories are my best as I was a nearing my 20’s, allowed to drink & had my own cash. It was during this time where I followed Arsenal all over the country, up to Sheffield when Big Ron took over & we got done 2-0, up to boro (crap hole), all London grounds & beyond. The thing I loved about away days was not necessarily the winning but the bond you had with other fans – you were on the road together, travelling miles to cheer on your beloved team. I liked learning the new songs, the ones about players are always my favourite as it associates them to the club & shows our love for them. Though I used to love “she wore, she wore, she wore a yellow ribbon…on our cup runs, Anthem. And of course “we are unbeatable, we are unbeatable”. Will that ever be sung again? I recall all the trips to Wembley & Cardiff, the one that stands out most was the 2-0 victory over Chelsea mainly because we were singing to the welsh police in “welsh” & we got kicked out the pub for “weeing” in the coat cupboard. Discusting I know!!! It was only Ray Parlour though….lovejoy is a mug!! I am lucky to have had some great memories. I have travelled to some fantastic grounds to watch my great club & experienced trips to Wembley, Cardiff (cup finals are great days) & done a few naughty things along the way. But the luckiest thing is to have been able to watch some of the best football this club has ever played, real privilege. All in all I will always love this club, I still have a season ticket in Block 10 & will always support whoever is wearing the Red & White shirt. I have had a few “heated discussions” on twitter, who hasn’t? I love talking arsenal & I love reading blogs & hearing stories from way back when. I now have a boy of my own, so there is one more gooner in the world now. I hope he gets to enjoy moments like I have had. I AM AN ARSENAL MAN, that will never change & nor would I want it too. I am off to buy a baby kit!!! We love you Arsenal we do, we love you arsenal we do………. This entry was posted in Arsenal and tagged Arsenal, She Wore, She Wore A Yellow Ribbon on April 9, 2015 by keenosafc.